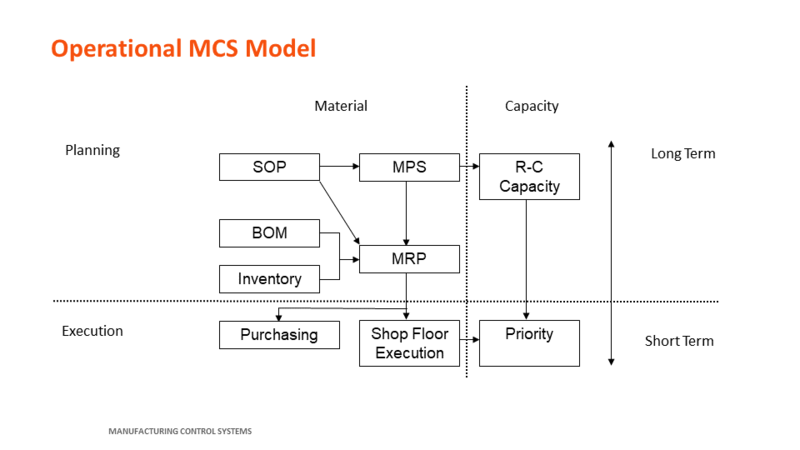 In our last post on MCS, we reviewed the Planning side of the Manufacturing Control System (MCS) model, which is the foundation for properly implementing modern Enterprise Resource Planning (ERP) packages. We will revisit the MCS model, which is divided into the planning side and execution side. We discussed the planning side, reviewing Bills of Material and Rough Cut Capacity Planning. In this post, we will continue this discussion, focusing on execution of plans. Planned orders for purchased material are converted to purchase requisitions as they are released from the MRP component. Need a review of the difference between MRP and ERP? Check out a previous article on this topic here. These requisitions are then applied to the existing vendor base. As they are assigned to a vendor, they become a purchase order where they remain until they are received into stock. Planned orders for manufactured parts are converted to manufacturing orders as they are released. In many organizations, these orders are kitted and routed to the first production work center. As work progresses, time is applied and work center data updated. When completed, the order is received into stock. Because open manufacturing orders form the basis of the Work in Process (WIP) inventory, they must be controlled. In effective organizations, these orders are opened and closed within the lead-time specified for the part. The lack of WIP control is one of the major causes of poor ERP system performance (e.g., as WIP increases, raw material inventory increases, throughput decreases, finished goods is starved and customer service decreases). This short-term capacity component was historically called “operations sequencing” but I chose to just called it “priority” because that is the components major concern. Because MRP “pushes” work into work centers to keep efficiency, a mechanism is needed to determine which job should be run next. The word priority also fits better when applied to purchasing as well. Determining the relative priority and reacting to short term changes is the mainstay of the function. The Manufacturing Control Systems model that we’ve just outlined is often referred to as a top-down planning, bottom-up feedback, closed-loop system. That means that if the orders pushed into the execution phase are unrealistic, data is passed back to the original demand and that demand is changed to make the execution order realistic again. By doing so, all other orders are realigned with the proper dates and priorities, resulting in avoidance of inventory build-up. A surprising number of manufacturing organizations that believe they are fully leveraging industry best practice simply do not use this model to set themselves up for success. My advice - don’t be one of them. We appreciate your time in reading through this post. Let us know if you have any questions or comments!